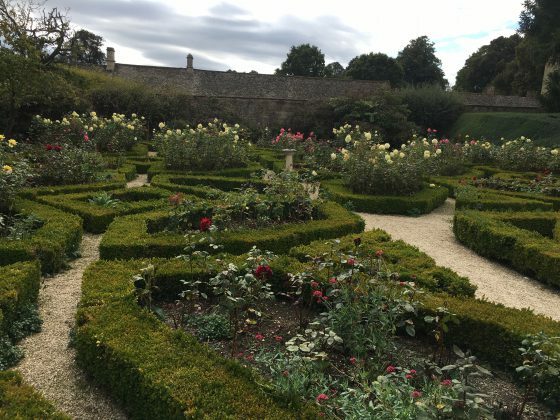 One of the nicest things about living in Lower Heyford, Oxfordshire, is that you can walk to Rousham Gardens in less than half an hour. Jerry and I love these gardens, and visited them several times. 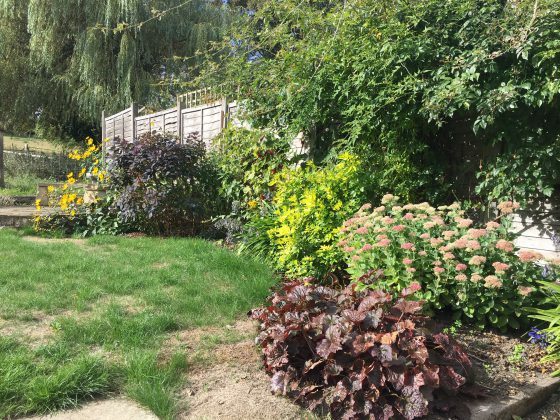 Unlike many of England’s more famous gardens, these are not at all commercial and remain totally unspoiled. There’s no tacky tea room and no gift shop! And we had Rousham all to ourselves. 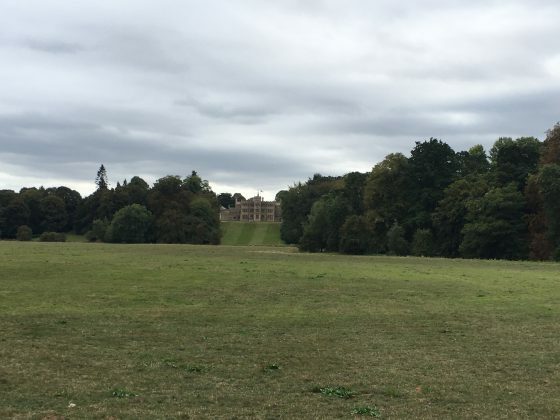 Rousham House was built in 1635 by Sir Robert Donner, and it’s still owned by the same family. The architecture is Jacobean. 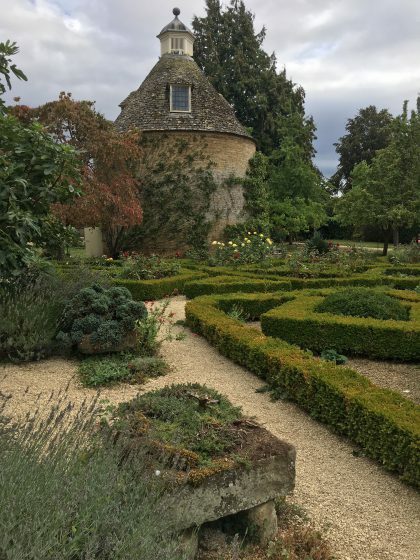 The gardens are often a pilgrimage for landscape architecture students because they were created by William Kent (1685-1748), who is considered the father of English landscape design. Fortunately, the gardens remain almost exactly as he left them. The formal gardens lead to the pigeon coop. 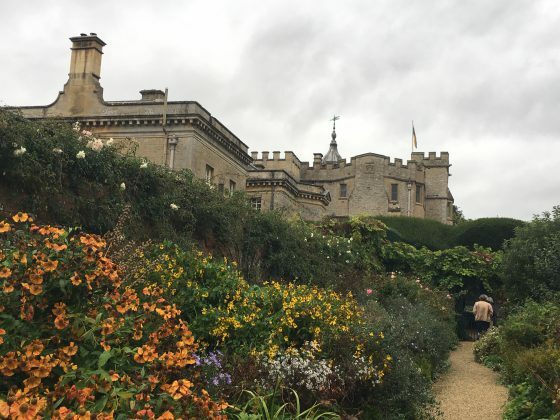 Rousham House is seldom open because it’s still occupied by the family, but the gardens are open every day. It costs just six shillings to go in and it’s on the honor system. There’s a big bushel of apples inviting you to take some home. 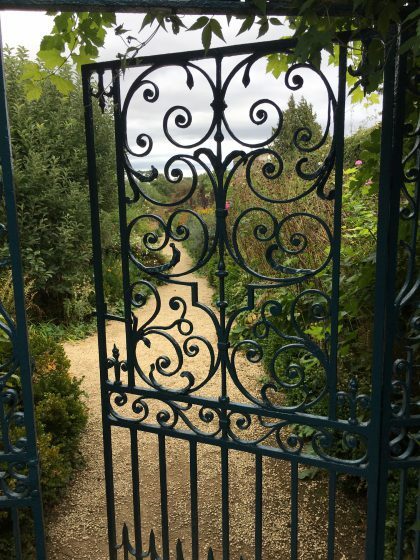 Sustainability is clearly important at Rousham and the gardens include many apple trees, as well as vegetables and herbs galore. There is an entire greenhouse just for the tomato crop. 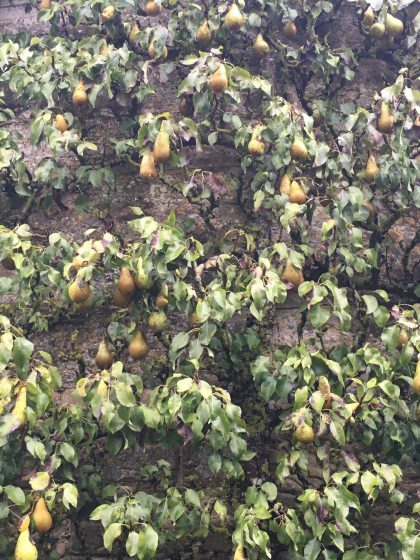 An abundance of pears grow up the side of the pigeon coop. There are interesting ponds, porticos, groves, streams and cascades scattered around the property, as well as classic Greek style statues of gods and goddesses. A herd of Long Horn cattle graze in the park. 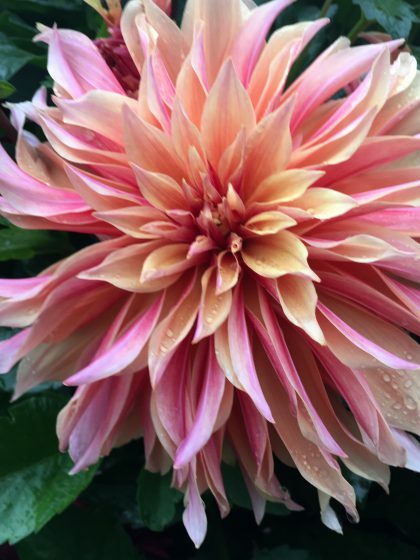 But it was the flowers that captivated me the most, especially the dahlias. 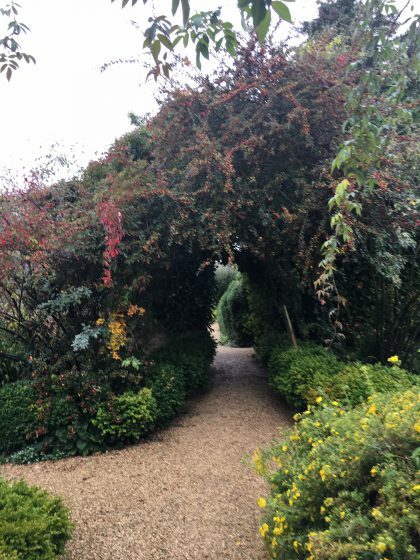 I love these beautiful little passageways to secret gardens. 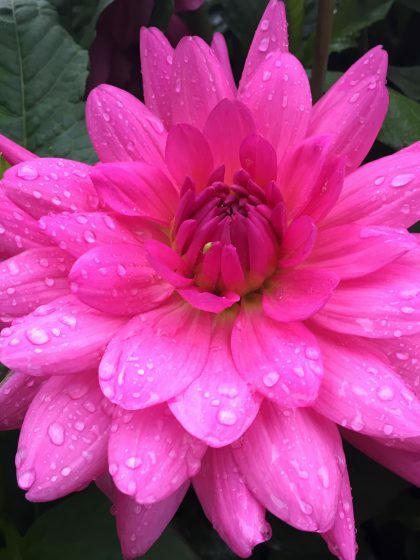 Now that’s a hot pink! 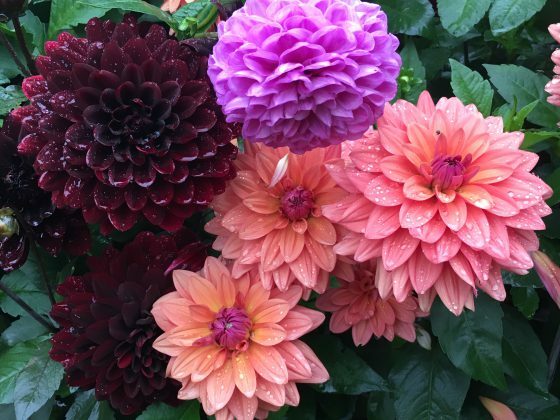 Dahlias come in such delectable colors! I love kids. I really do. ( I even have one of my own.) But it’s nice to know that Rousham Gardens does not allow kids under the age of 15. It’s a place for quiet contemplation and perhaps a picnic lunch. Silent and serene. This weekend, and the first weekend in November, bring us an art show that offers an ideal excuse to spend a day in the country. Five artists and artisans come together to show their latest creations just in time for the start of the gift-giving season. 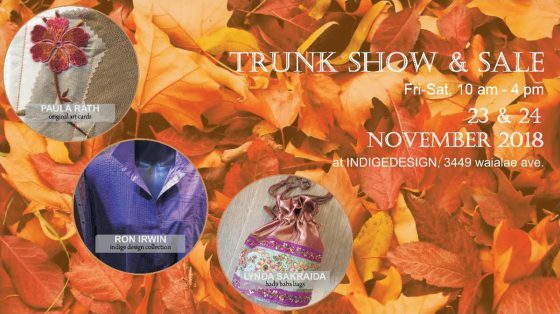 The show will feature paintings and giclees by Hiroshi Tagami, ceramics by Kenny Kicklighter, jewelry by Babs Miyano and clothing by Elizabeth Kent. Painter Michael Powell says this will be his last Kahalu’u art show. 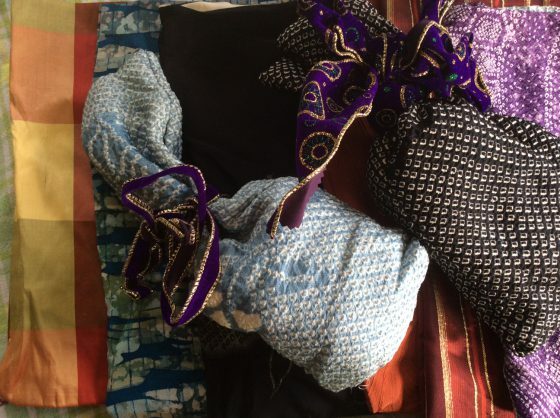 Kent, designer and maker of Vested Interest, will introduce her charming little silk gift bags. They’re perfect for a jar of chutney, some decorative soaps or a little bauble of any kind. 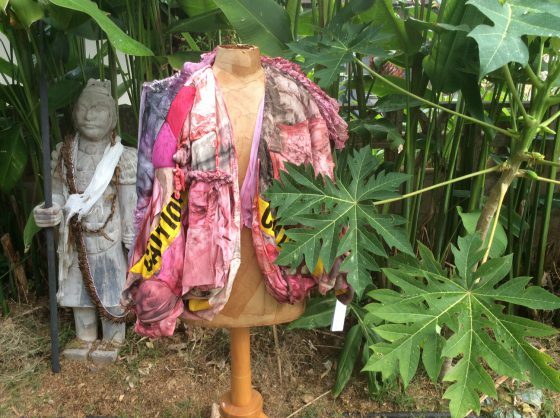 She has also fashioned dyed lingerie, patched together to create the jacket above, which she calls “Meet Me at the Meat Market.” It’s a political statement protesting one of Kent’s causes: human trafficking. 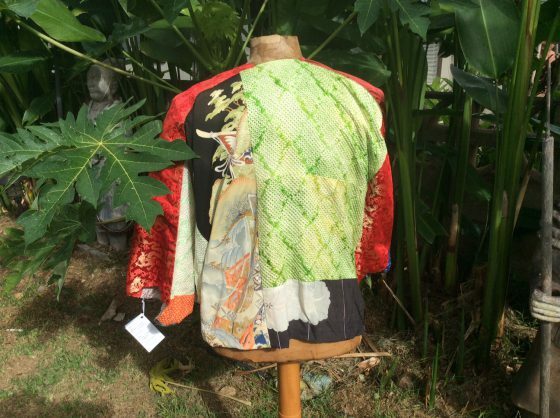 The back of a patchwork jacket. 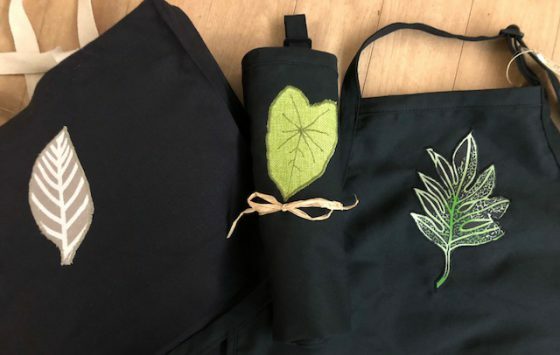 Babs Miyano has also been working on some new products, including appliqued aprons and tote bags. Her newest line of jewelry includes earrings fashioned with druzy crystals, as well as her popular eyeglass holders (made with a little help from her mom). Don’t miss her lauhala bags embellished with amethyst crystals and bodhi leaf skeletons. Why not pack a picnic brunch and stop at a beach park on the way out to Kahalu’u? We all need little reminders that we are lucky we live Hawaii. 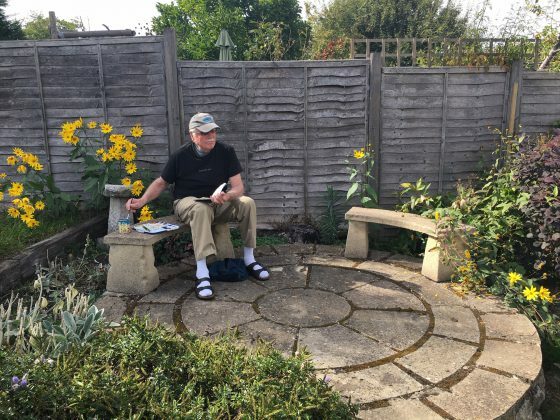 Following our rather intense two-week watercolor workshop with Australian artist John Lovett, we wanted to have some time to absorb what we learned and paint on our own before touring more of England. It’s way too easy to lose your rhythm as an artist, and once you let go, it’s often hard to get back. 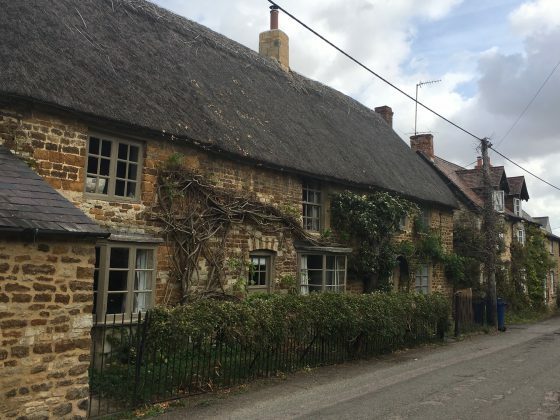 I did some homework early this year and asked several friends from England if they would recommend a small, quiet, quintessential English village for us to live and paint for a spell. Two sources came up with the same village: Lower Heyford, in Oxfordshire. 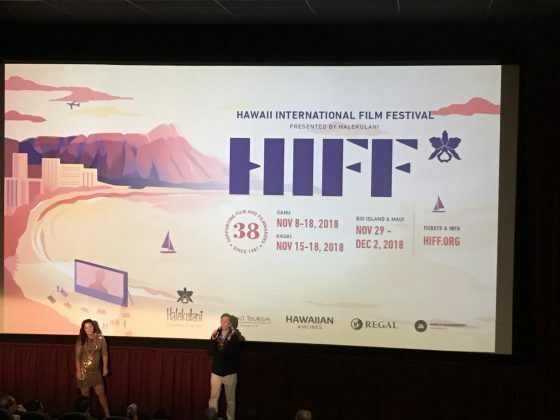 One of those friends was Chris Oliver, a dear friend and colleague, the former travel editor at The Honolulu Advertiser, who lives half the time in Kailua and the other half in Cambridge, England. 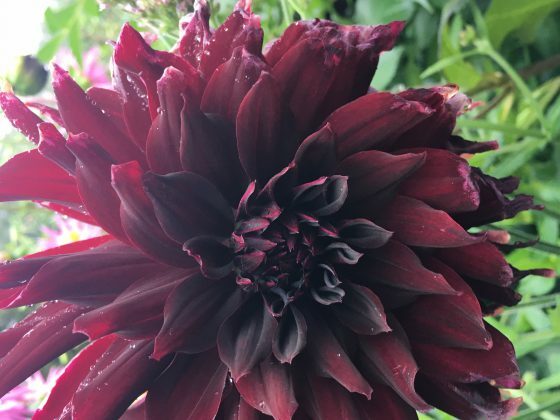 Chris has a friend who lives in Lower Heyford and she and her husband, Gareth, have visited there often. The other source was Brett Thiebaut, who attended Oxford and fondly remembers Lower Heyford. Jerry enjoyed painting on the patio at the back of the cottage. 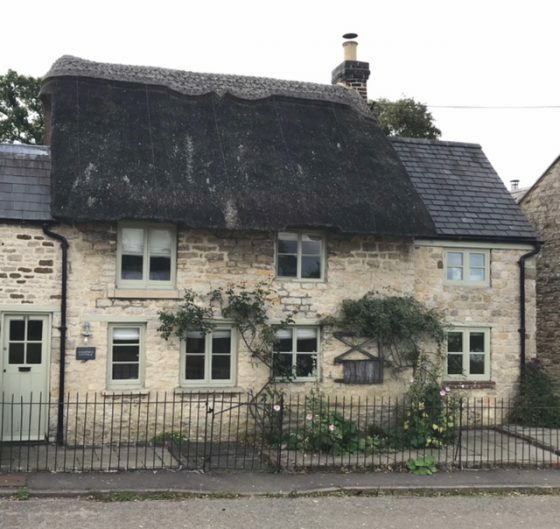 I went online and found just one cottage for rent in Lower Heyford: Coopers Cottage, available through ShortLetSpace, a company based in Woodstock, Oxfordshire. I booked it immediately. We were happy that the TV didn’t work, as we had plenty of time to read novels. 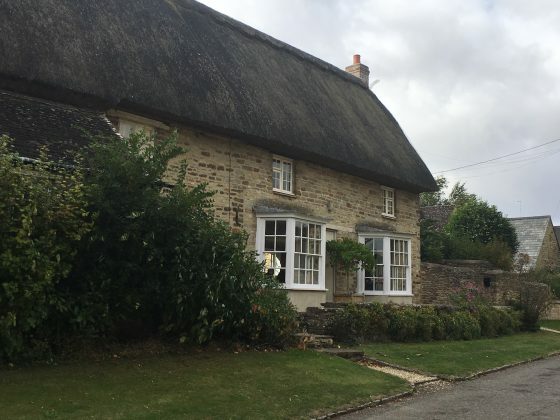 The cottage is 400 years old, at least the central thatched part is. On either side are additions. Where ladders once were, there are now stairs going up to the bedrooms. 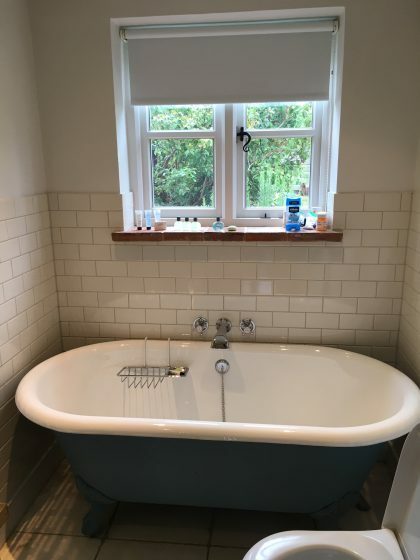 The kitchen and bathroom are new and very efficient, except we didn’t have hot water the first week. But we had a tea kettle and I just boiled water for a bath. The wood fireplace in the living room is lovely, although it was seldom cold enough to warrant a fire. Our good weather continued after the watercolor workshop. Lower Heyford is very quiet and rural. Traffic is sparse and non-existent after about 6 p.m. 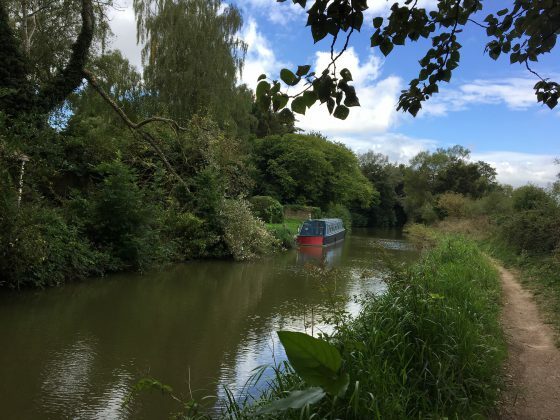 There are lots of lovely walks to take, around the neighborhood and up and down the canal on the Cherwell River. 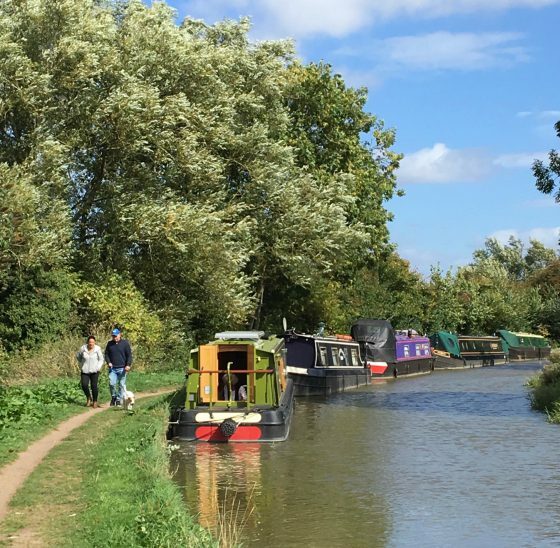 Lower Heyford is known as a hub for long boats, the barge-like boats that people can rent to travel on the canals, through locks and under bridges. On weekends the long boat business really picks up. 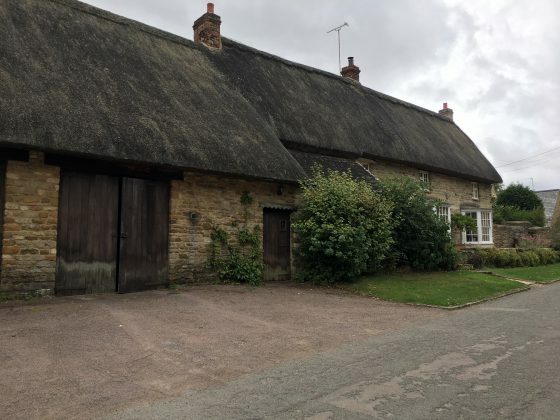 We were delighted and surprised that there are many thatched roof homes in Lower Heyford. One such home was being thatched while we were there and we had an interesting discussion with the thatcher. 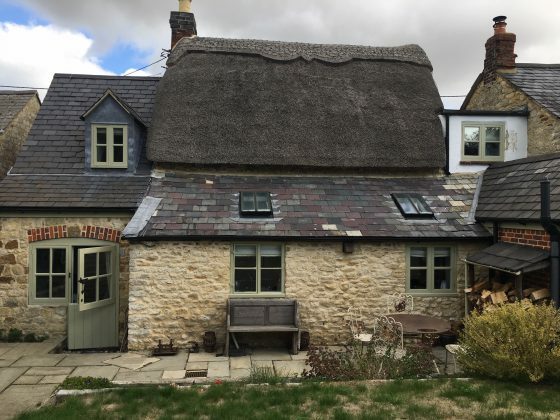 The average roof needs to be thatched about every 25 to 30 years. 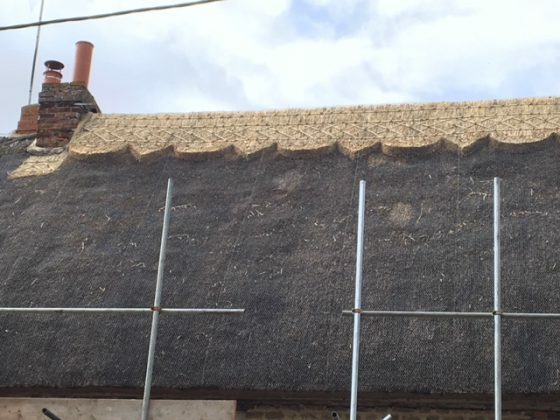 The decorative portion, which also keeps the thatch pinned down, is refurbished about every 15 – 20 years. 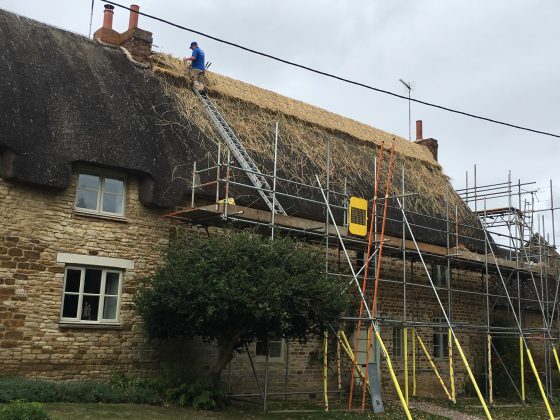 Luckily, there is a new generation that is learning the trade, so thatching will continue to be viable. 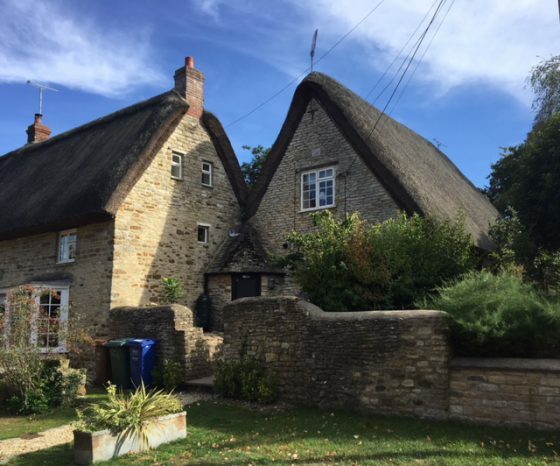 Here are just a few of our neighbors’ thatched roof homes. 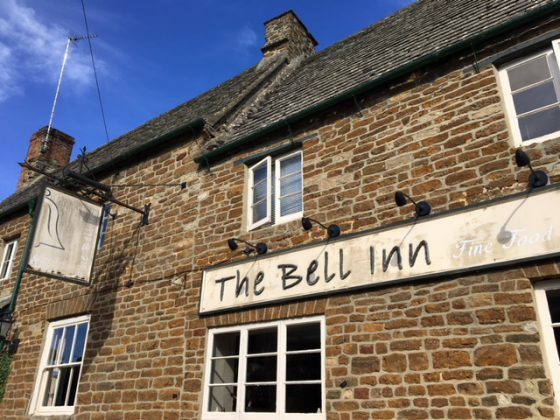 A five-minute walk away was the local pub, The Bell Inn, with good draft beer and yummy steak and kidney pie. Kizzie’s, where they served a delicious breakfast and lunch with great coffee, was a godsend. 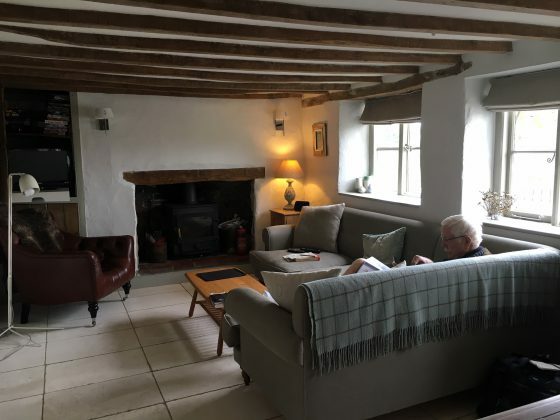 Lower Heyford offered us the perfect respite for a quiet, serene and creative time well spent. 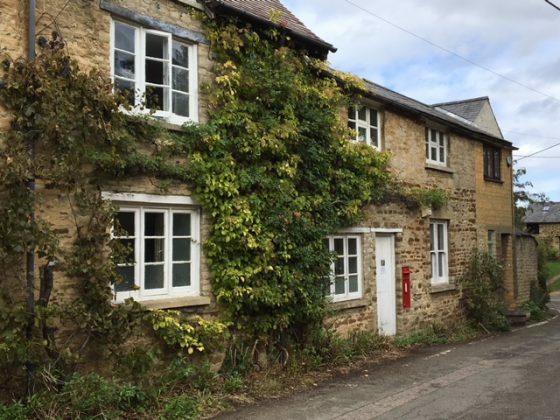 Perhaps next year we’ll rent a cottage near Cambridge or in Chipping Campden….